CLEARFIELD – The Clearfield Volunteer Fire Department held its annual banquet Saturday night with guest speaker, State Rep. Tommy Sankey, R-73 of Clearfield, and the presentation of several awards. Sankey began by noting that several firefighters who were scheduled to be at the banquet were instead responding to a call at his cousin’s house that night, and he thanked them in absentia for responding. He noted that two years ago, at the banquet, there was an alarm and in seconds the room had emptied leaving just a small handful of people who were not firefighters to wait patiently. 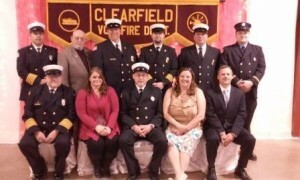 Volunteer firefighters, Sankey said, are full-time firefighters, whether it’s responding to calls, working at fundraisers, aiding other companies or the many other things they do, being a firefighter is a full-time commitment of the volunteer and their family. He said they are the ones who do something vital for the community, they keep everyone else safe. “Thank you very much, and God bless you all,” he said. Sankey also brought with him a citation for the fire department’s 150th anniversary, which was last year. Due to the tragedy of the death of Firefighter Jeffrey Buck, the annual banquet was postponed and Sankey was unable to attend, and so he was asked to bring it to this year’s banquet. 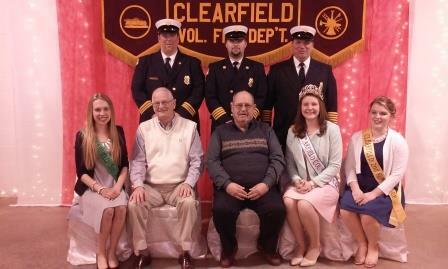 Abby Jamison, 2015 Clearfield County Fair Queen, also spoke briefly and said that she hopes to someday have the same qualities she finds in the local firefighters: courage, the ability to be light-hearted and have fun and also passion for what they do and go the extra mile. “Thank you just isn’t enough,” she said. Following the speakers was the awards presentation. Second runner-up for responder of the year with 124 calls is Brett Collins, first runner-up is Louis Stubbs IV with 132 calls and at the top is Brandon Barnett with 139 calls. Driver of the year is Steve Flanagan. Firefighter of the year is Andrew Smith and fire person of the year was given to two people, John R. Williams and George Waring for being on hand at the station to help wherever they can. The Chief’s Award was presented to Todd Kling. The fire police awards followed with Bruce Maines named fire police of the year. 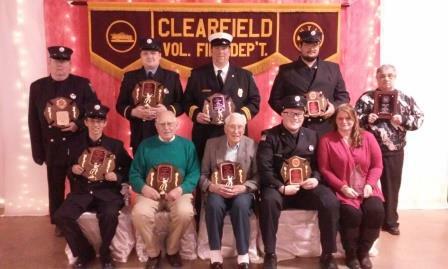 Top responder for fire police is Sam Toto, and the captain’s award was presented to Bill Shugerts. Members for 25 years include Matt Buck, Barry Dimmick, William Gutheridge, Todd Kling, Edward Kumm, Gerald Luzier, Richard Mattern, Brian McMullen and Timothy Potts. Members for 50 years include James Anderson, Robert Derrick, James Gearhart, Robin Lawhead, Gary Mann, Gary Marshall, Jack Oakman, Franklin Shugarts, Walter Thorpe III and Benjamin Williams. A new award this year was the president’s award for someone outside of the fire company who does many things behind the scenes, and this was presented to Joan Williams. The evening concluded with a reading of names of those members who passed in 2015 and the Firefighter’s 23rd Psalm. Those who passed include John R. Butler, Paul B. Kline, Robert Grimminger, James J. McDermott, James H. Brown, Jeff Buck, William G. Blake, John G. Livergood, Clarence J. Baumgardner, Marvin G. Fink, Gary “Doc” Woodel, Patrick J. Flanagan and Richard L. Gardner.